The Big Easy, otherwise known as New Orleans, is like no other city in the United States. Jazz is God, Bourbon Street is the scene of revelry and merriment 365 days a year and Creole is still spoken amongst many of the locals. It is a city that takes immense pride in its rich history and regularly pays homage to all things that make New Orleans a wonderfully unique and diverse place. New Orleans was passed back and forth between the French and Spanish during its first century as a European Colony. As a result of the Louisiana Purchase in 1803, New Orleans became part of the United States. Because the city was treated as a hot potato for the first several hundred years of its existence, the various cultures merged over the years to create a diverse community that is unparalleled to any other in the country. New Orleans is a city that revels in the smoky sounds of blues and jazz. Po-boys are the sandwich of choice (you'll be hard put to find a regular sub sandwich in the entire city, unless it is from Subway) and New Orleans has an unsurpassed ability to throw some of the best parties ever. 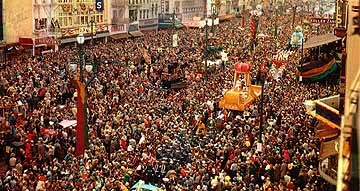 New Orleans is infamous for its Mardi Gras celebration, as well as the highly acclaimed New Orleans Jazz Festival. The world has discovered that there is much more to New Orleans than these annual festivities. A trip to New Orleans will long remain in your memory after the sounds of the French Quarter have left your ears. The French Quarter is a must see for anyone exploring New Orleans for the first time. At the mere mention of New Orleans the mind automatically conjures up the French Quarter. 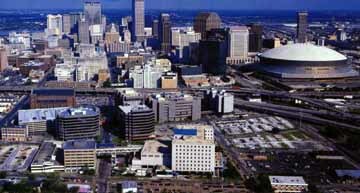 This area of the city is absolutely bursting with activity and it is from here that New Orleans' heartbeat resounds. Tourists crowd the streets taking in the sights and sounds around them. Entertaining street performers regularly put on shows that demonstrate their various and often unique talents. Jazz can be heard wafting from the many open aired bars. Preservation Hall is the place to go to enjoy traditional jazz performances. The dining and cuisine in New Orleans is unprecedented and the majority of the restaurants specialize in French or Cajun fare. Emiril Lagasse has even chosen New Orleans as the perfect place to have his own restaurant. After a delicious meal, head over to Caf� du Monde to taste their specialty, beignets. You have not experienced New Orleans if you haven�t indulged in these tasty treats that are a staple to the city. To get a feel for the French Quarter�s immense importance to New Orleans, take a guided walking tour. Many will be surprised to discover that there is much more to this area than bars and partying. The horse carriage rides through the Quarter are a romantic and fun way to explore the Big Easy. Numerous art galleries reside in the Quarter, many of which display the creations of local artists. There is no better way to acquire a reminder of New Orleans than taking home a unique piece of art that reflects the essence of the city. A great way to see other areas of the city is a ride on the St. Charles Streetcar. Riders can sit back, relax and truly take in all of the beauty encompassing New Orleans. Beginning in the Central Business District at Canal Street, the streetcar travels through the magnificent Garden District. While in the Central Business District, aquatic life enthusiasts should visit the Aquarium of the Americas, home to hundreds of different species of marine life. Taking a ride on the streetcar allows visitors to get a glimpse of New Orleans' beautiful residential areas. Magnolias, stately oak trees and palms line the streets and fill the yards of historic homes. Gorgeous homes with wraparound houses, Tulane University and Audubon Park are some of the sights to be seen. The Garden District also has many beautiful hotels and inns. Magazine Street is the location of some wonderful shops. 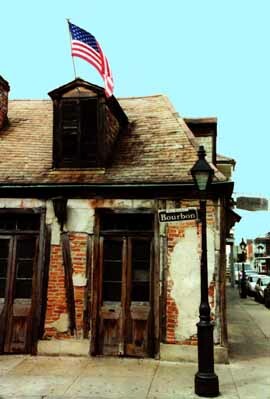 New Orleans was also home to the esteemed writer William Faulkner. His old home has been turned into a very warm and inviting bookshop that sells many of Faulkner�s first editions. If you are fanatic about football, try and catch a Saints game if you're in the city during the season. New Orleans is also famous for its cemeteries. Because the city floods several times a year, the dead are laid to rest above ground rather than in coffins. The mausoleums that fill the cemeteries are intricate and ornate, telling the life story of the person that rests inside. 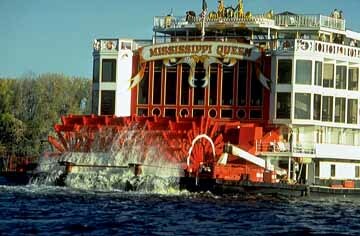 New Orleans has always had a love affair with the Mississippi River. Woldenberg Riverfront Park is an ideal spot to enjoy a picnic lunch and watch the comings and goings on the Ole Miss. Various boat rides are offered down this mighty river. New Orleans always has and will walk to the beat of its own drummer and makes no apologies for it. Although New Orleans is as modern as any other city in the United States, there is a wonderful feel that you have been transported back to the past.